In plant taxonomy, wood density is not usually used as a classification criterion, although it could be used as a complementary measure. The aim of the present study was therefore to verify whether the xylem tissues of species belonging to the same taxon (genus or family) are similar in terms of density. In order to test this hypothesis, we examined previously reported wood basic density values for 241 tree species growing in Latin American forests and belonging to 64 genera in the families Anacardiaceae, Burseraceae, Meliaceae, Rutaceae, Sapindaceae and Simaroubaceae (order Sapindales). 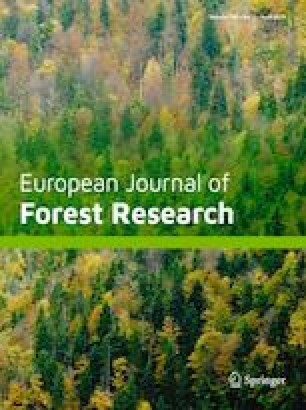 An estimated 57% of the species analyzed had light or very light wood (basic density < 0.65 g/cm3), although the density of the whole sample varied widely between species, from 0.24 g/cm3 for Bursera instabilis to 1.23 g/cm3 for Schinopsis brasiliensis. The lightest woods generally corresponded to species in the family Simaroubaceae and the heaviest ones to species in the family Rutaceae. The interspecific variability in basic density decreased significantly as the number of species examined in the taxon increased. Thus, species in Simaroubaceae family, the least represented in the whole sample, yielded the greatest variation in basic density between species. The findings verified that, as a single criterion, basic density is insufficient to distinguish all families and genera considered in the study, as the density did not differ significantly between Burseraceae and Meliaceae or between Sapindaceae and Rutaceae. In addition, within each family the basic density only differed significantly between four of the genera: Protium (Burseraceae), Trattinickia (Burseraceae), Zanthoxylum (Rutaceae) and Cupania (Sapindaceae).